There have been a number of themes covered over and over again during the life of this column, including the examination of the Twin Cities’ rampant racial disparities, which have consistently ranked among the worst in the nation. Likewise, there has been a litany of reasons cited for such inequity, not the least of which are the legacies of both individual and institutional racism. Now, in tandem, those two legacies are highlighted in the recent Twin Cities Public Television documentary Jim Crow of the North. Produced by award-winning filmmaker Daniel Bergin, Jim Crow of the North (featured prominently upon its release in the pages of the MSR), follows the ground-breaking work of Mapping Prejudice, a project based out of the University of Minnesota. Through extensive historical research and analysis, Mapping Prejudice has helped to unearth the shameful history of racial covenants and redlining in Minneapolis dating back more than 100 years. This group also seeks to embark on a project that will pull back the curtains on similarly restrictive covenants in St. Paul. Mapping Prejudice has already skilfully connected modern-day inequities to the systematic oppression and discrimination of the past. This leads to another theme that has been frequently explored on these pages: gentrification. In most American cities throughout the 20th century, people of color, African Americans in particular, were relegated to separate and structurally unequal communities often by means of the practices briefly referenced above. Yet, in spite of the disadvantages they faced, the people in these neighborhoods found a way to buy homes, build successful small businesses, support their public schools, and create strong faith communities that have lasted generations. 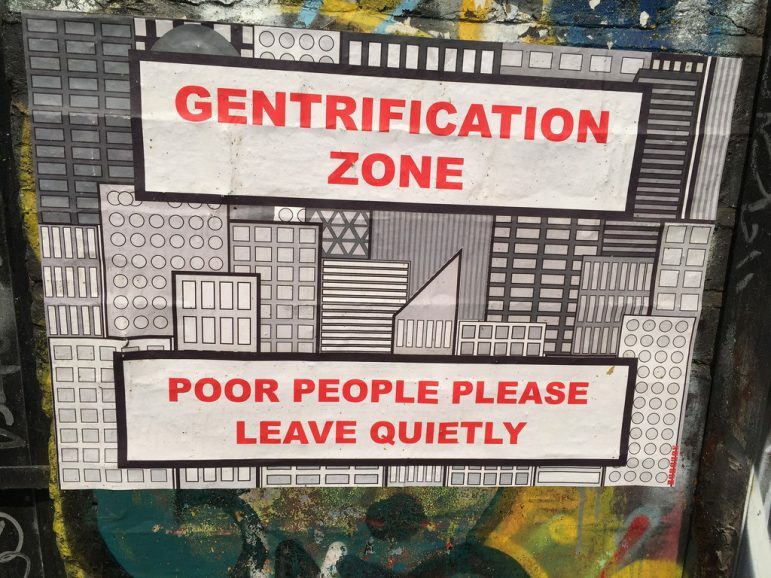 During the last quarter or so of the 20th century (and into the 21st), the process of gentrification significantly displaced people of color and poor residents from these communities, often under the dubious pretense of urban renewal. Many neighborhoods and their institutions are under constant threat; in fact, some have already been wiped off the map so to speak. Take Albina, for instance, the historic neighborhood in Portland, Oregon where African Americans first started to settle in 1910. In the name of progress, the construction of Interstate 5 through this community initiated the process of gentrification in the 1960s. At the time, the Black population of Albina was 80 percent; today it is less than 20 percent. Of course, on the east side of the Mississippi this sounds all too familiar. St. Paul’s Albina was called Rondo, and its I-5 is our I-94. Again, what we see is a nationwide and decades-long process where, in essence, the law — along with banks, real estate companies, and community members themselves — consigned African Americans, other people of color and the poor to what were considered the least desirable neighborhoods in our cities. Decades later, after much neglect, they return to push the children and grandchildren of those folks out in favor of plush condominiums, trendy boutiques and restaurants, and so on and so on. Around the time that the Green Line was being built from downtown St. Paul to downtown Minneapolis, several studies sought to address the potential impacts of gentrification in the Twin Cities. There was also talk from some corners about how gentrification in Minneapolis and St. Paul would look a lot different than it has in other cities. In St. Paul’s Frogtown neighborhood, many residents have had to “double-up,” unable to cope with rising rents by themselves. Moreover, the “frequent ‘Coming Soon’ signs” have spiked fears of commercial and retail changes that don’t reflect the historic character of the community. Which brings me to the new soccer stadium that opens for play in a couple of weeks. I have absolutely nothing against the stadium, the team that will call it home, or the sport of soccer for that matter. Perhaps what concerns me most about the stadium is that it simply looks out of place in the neighborhood it occupies. What concerns me is that the neighborhood will ultimately be forced to change so that the stadium no longer looks and feels out of place. And if it does change, who will benefit from the new jobs, the new housing, and all the rest of this new development?